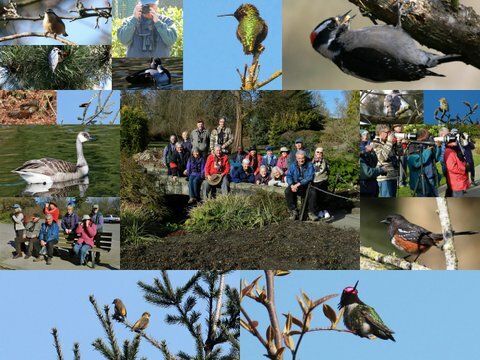 Seventeen very fortunate birders (Roger, Mike, Anne M, Sheila, Jane, Lorna, Gerhard, Ken & Anne, Marion, Donna, Janet without Vienna Bryan, Bev, Jonathan without Lorraine, Terry, Kaye and me) spent a glorious Monday morning prancing in the Spring sun and warmth at Queen Elizabeth Park in downtown Vancouver. 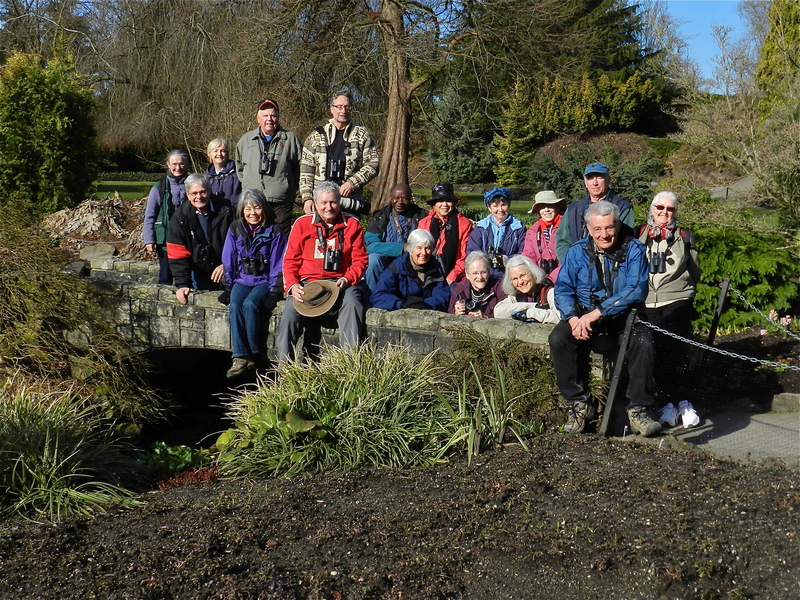 Lots of hi-lites including: Red Crossbills, both Anna’s and Rufous Hummingbirds, lovely Spring flowers, beautiful vistas of Vancouver and the surrounding mountains, tasty home-made tidbits and the usual hum of senseless conversation. 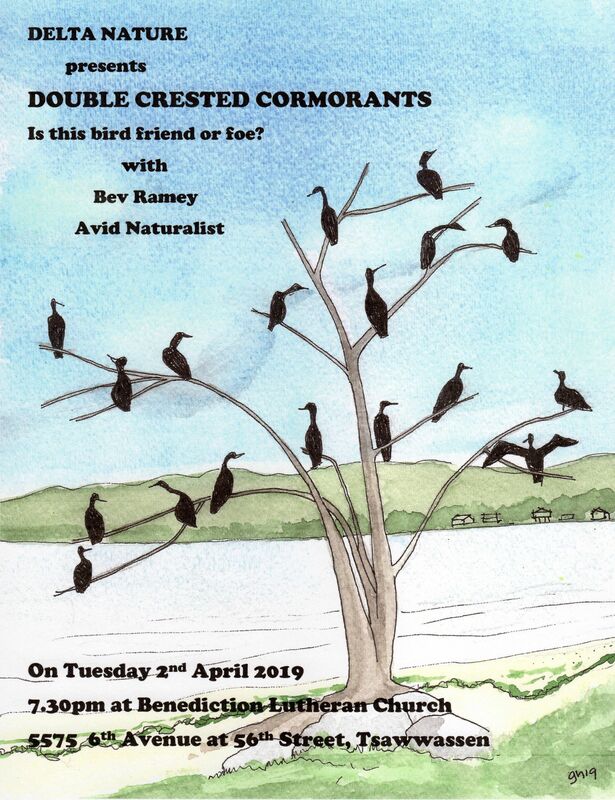 Check out Ken’s, Jonathan’s, Marion’s, Terry’s and Roger’s beaut photos of birds, plants, people and scenery on our Picasa site which you can easily link to from our DNCB Blog at: www.dncb.wordpress.com. Three carloads left Petra’s at 8:00 a.m. and we practically flew into Vancouver via the tunnel and HOV lane; very little traffic as it’s School Spring Break. 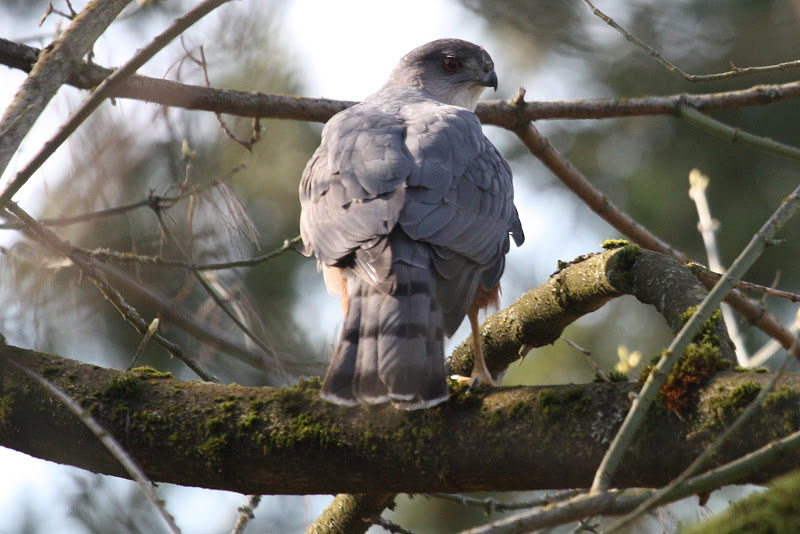 We met the others at the tennis court parking lot around 8:30 a.m. where a Cooper’s Hawk was posing at the top of a deciduous tree. Following introductions, we wandered over to the Hummingbird feeder at the golf course entrance shop. We saw both Anna’s and Rufous Hummingbirds here, and they were flashing their irridescent throats in the sun. 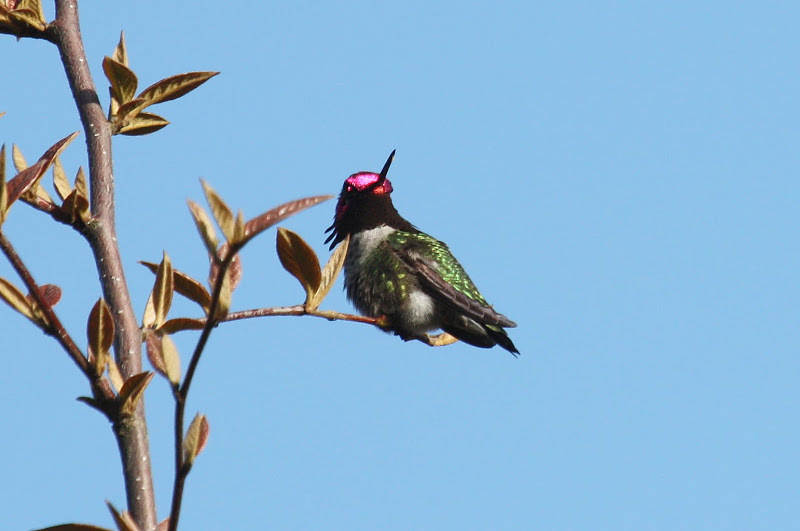 We saw lots of Hummers during the day, including a nesting Anna’s on the other side of the Park. Under Janet’s expert leadership, we strolled up the path past some of the many manicured gardens and an unusual intertwined Willow fence, to the trees where the Barred Owl has been seen. We were blanked this morning, but Marion saw and photographed him later in the day. 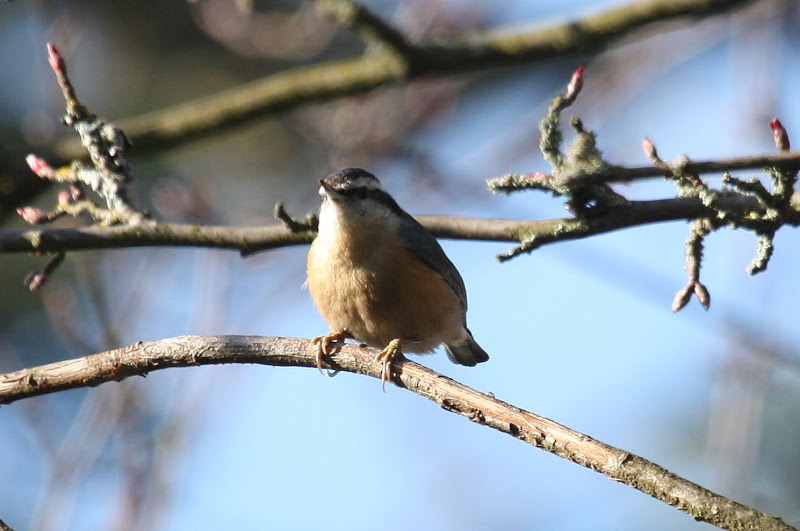 Red-breasted Nuthatches were honking and three were seen in three adjacent trees. 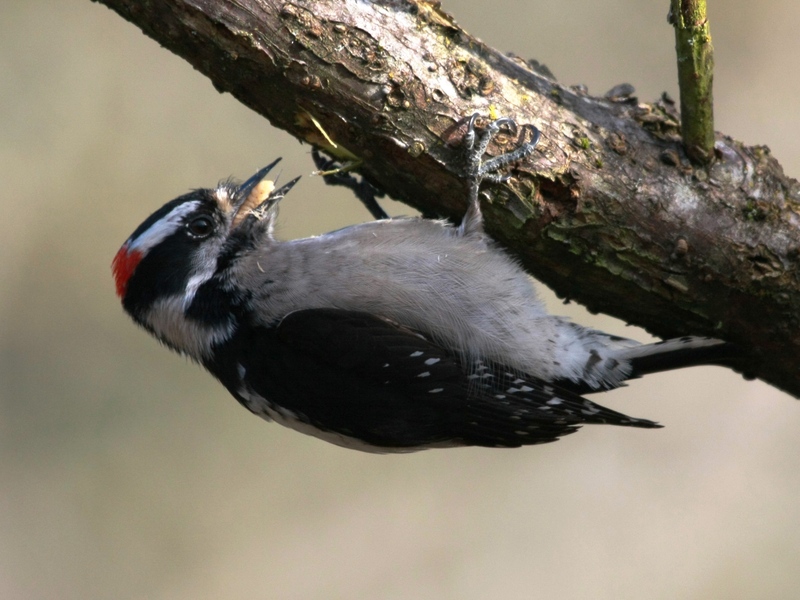 We did not see the Red-breasted Sapsucker that we saw here last year. We crossed the road behind the restaurant and along this path we heard and saw Ruby-crowned Kinglets. 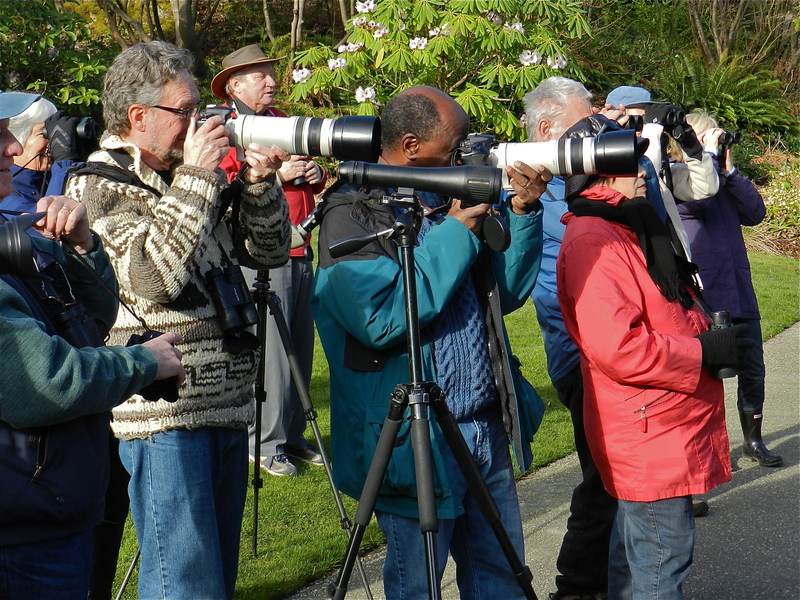 We saw, and got good shots of Golden-crowned Kinglets later on. Lots of Pine Siskins around too. 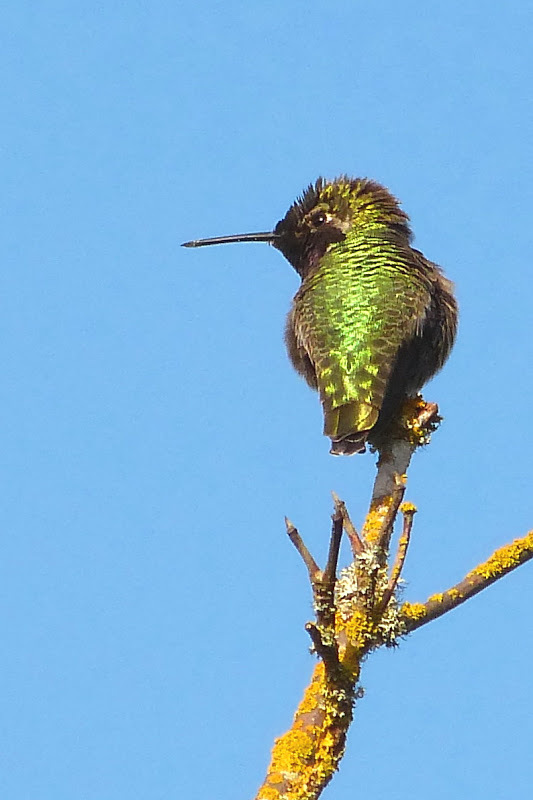 At the Observatory entrance and lookout, an Anna’s Hummingbird posed on the fork of a branch which framed the Sleeping Lions in the distant snow-covered mountains. A beautiful vista with the high rises of Vancouver below and the sun behind us. 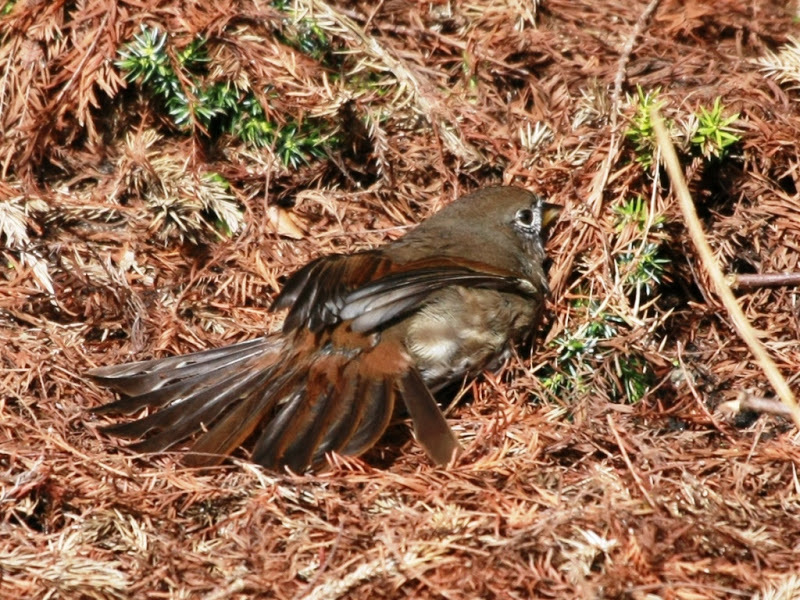 We heard Pacific Wrens (Marion got a photo later) and we saw a Bewick’s Wren in a weird garden (Gunnera manicata covered with straw & dead leaves – see photos). Fox, Song and Golden-crowned Sparrows seen here too. 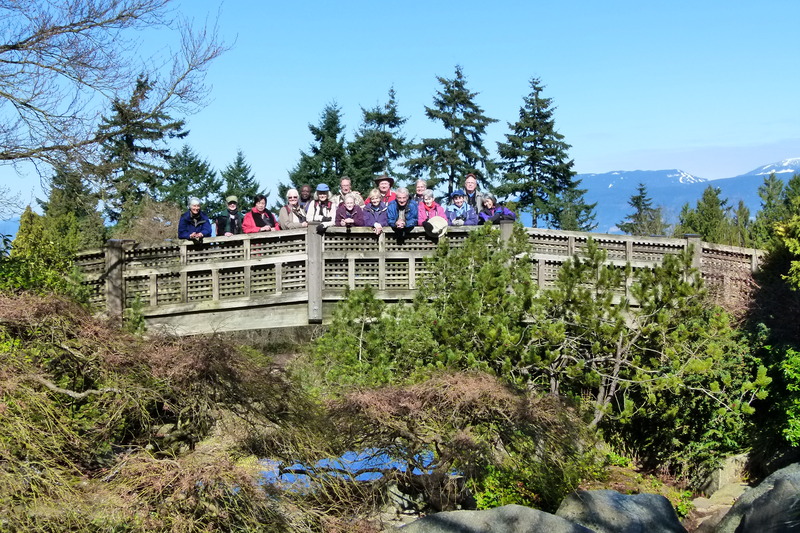 We took one of a few Group Photos on a bridge at this garden and another on a bridge near the Observatory. Roger lead us to another spot where a couple of Red Crossbills flew overhead and landed at the top of a conifer. We all got good looks at both male and female, and their “crossed bills”, as well as a Pine Siskin beside them. Another Cooper’s Hawk behind us, which may be nesting there, caught some photogs’ attention. as he pecked away. Fascinated, we watched intently, and finally he pulled out an inch-long grub which he swallowed so quickly that many of us missed it. He kept pecking and caught at least two more grubs. 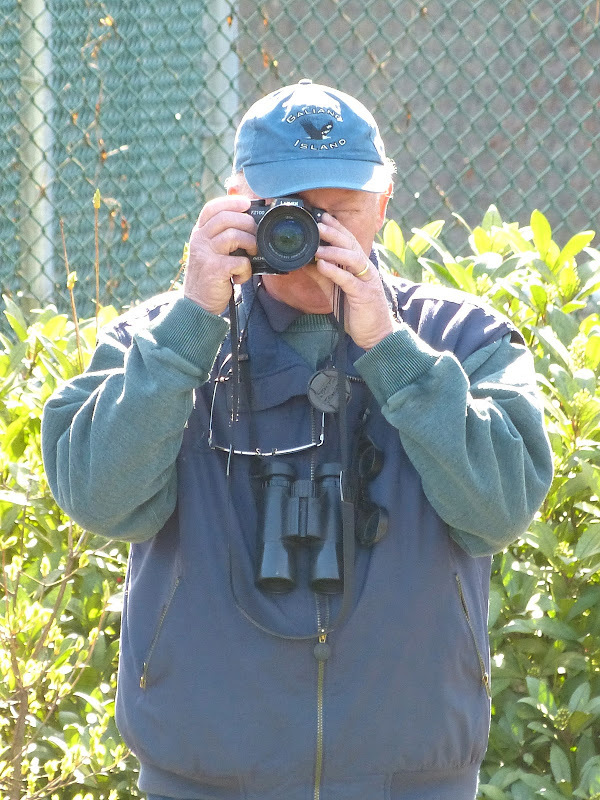 We followed Jeremiah’s instructions to where the Hutton’s Vireos are nesting, but we were blanked, although Janet & Marion heard them later, and Roger also saw the birds later. 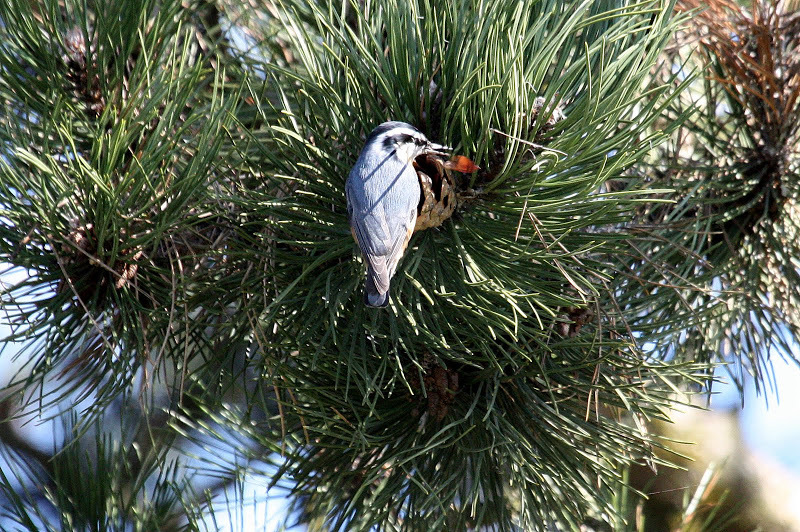 Bev spotted a “brown creeper” (aka Hummingbird) flying up and down a trunk. We did see a real Brown Creeper earlier. 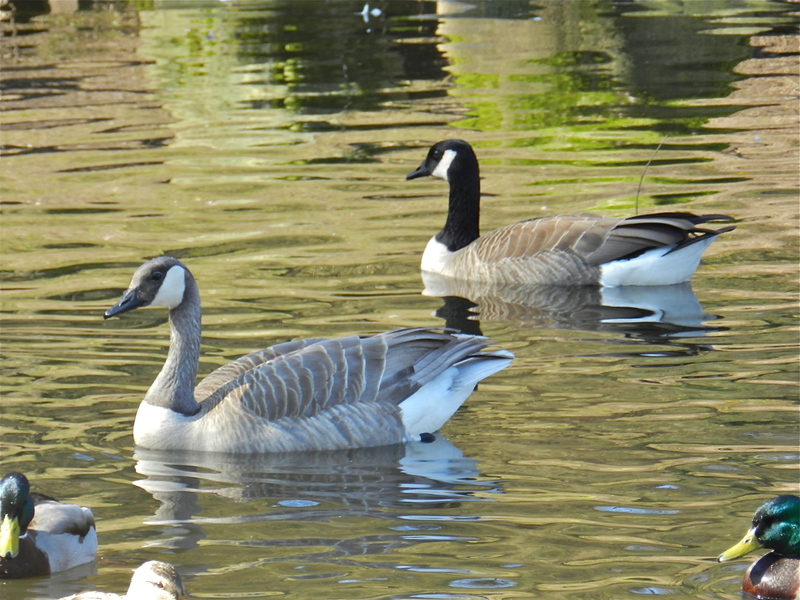 In the pond below were many American Wigeons, two male Ring-necked Ducks and a “Grey Goose” (hybrid Canada Goose x Greater White-fronted Goose). 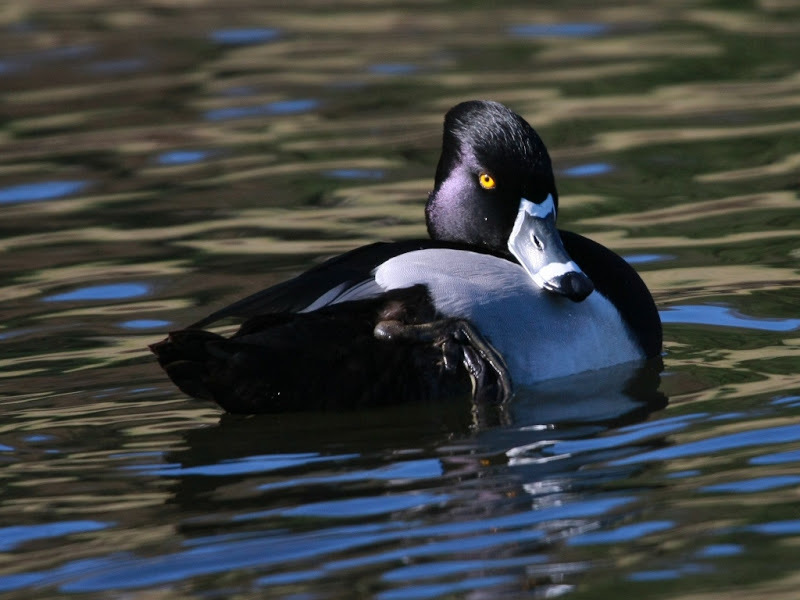 We saw many other common species, and probably other species worth mentioning, but I forget. We got back to our vehicles close to Noon and Bev shared her delicious home-made cookies. And Lorna surprisingly came through with a tasty egg salad sandwich and an exquisite mince tart which I savoured along with Jane’s banana. Having pleasantly satisfied my hunger pains, the drive back to Tsawwassen listening to Gerhard’s gibberish didn’t bother me a bit. Another awesome DNCB outing. 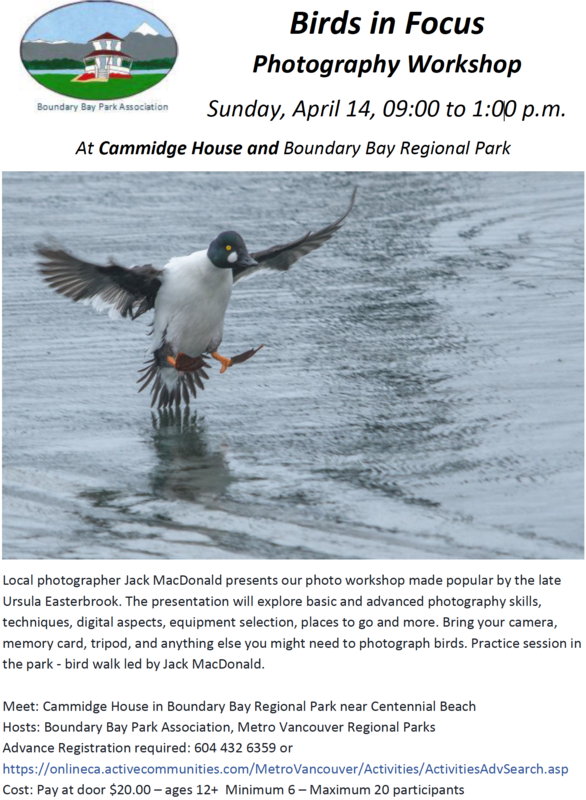 Next DNCB outing on Easter Monday, April 1, will be to MapleWood Flats/Park, leaving Petra’s at 8:00 a.m. For those meeting us there, we should be at the parking lot by the Nature House (off Dollarton Highway) around 8:45 a.m., depending on traffic. The following week, we will change the weekly DNCB outings to Wednesdays (not Mondays), leaving Petra’s (on April 10) at earlier time 7:30 a.m. 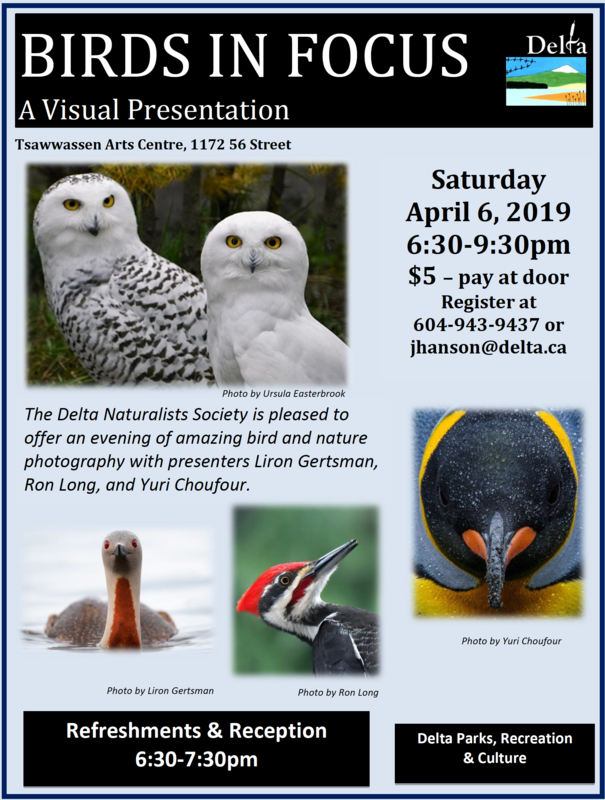 This entry was posted in *DNCB, Barred Owl, Cooper's Hawk, Hutton's Vireo, Red Crossbill. Bookmark the permalink. Hummingbird was sitting on a nest. Check out photos on our DNCB Picasa site (see Link from Blog).